It’s bound to be a close game whenever two ranked teams meet up, especially in the Pac-12. No. 19 Cal women’s tennis had its share of tight matches this weekend at home, first losing to No. 15 Washington (16-2, 6-1) 4-3 and later defeating No. 36 Washington State (17-7, 2-5) with the same score of 4-3. Cal, after splitting these matches, moves to 10-6 with a 4-3 conference record. For significant portions of Friday’s match against the Huskies, the Bears were in the driver’s seat. Even after losing the doubles point for the third consecutive conference match, Cal led 2-1 and 3-2 as the match went on. 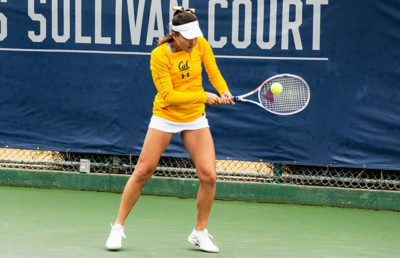 The Bears have been focused on improving their doubles play since losing both the points against USC and UCLA last weekend. 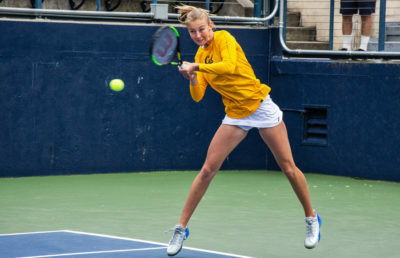 Cal broke its doubles losing streak Saturday against Washington State, bringing its doubles record to 1-1 for the homestand. No. 28 duo Anna Bright and Jasie Dunk quickly handled their doubles match-up against the Huskies 6-1, their first victory since the nonconference match vs. Hawaii. Cal then lost the two following doubles matches, including the upset of No. 13 Hana Mraz/Julia Rosenqvist by No. 38 Stacey Fung/Nika Zupancic, and conceded the doubles point to Washington. That different match would have resulted in a very strong conference win for Cal, which it needed coming off two conference losses at USC and UCLA. Against the Huskies, the top-three singles courts played perfectly. Rosenqvist (court one), senior Olivia Hauger (court two) and Bright (court three) opened with strong energies, winning in two sets. The script was flipped for the Bears on the back half of the singles courts. Court four, five and six were lost in two sets even though senior Maria Smith forced tiebreaks in both of the sets. Putting a complete performance together is a challenge that any college tennis team faces when trying to win a match, since tennis consists of playing individually for 6 of the 7 available points. As for the doubles aspect, better teamwork was on display for the Bears the following day against the Cougars. Cal won the doubles point without losing a set to Washington State. The singles matches against the Cougars were just as even as they were against the Huskies, splitting the courts 3-3. 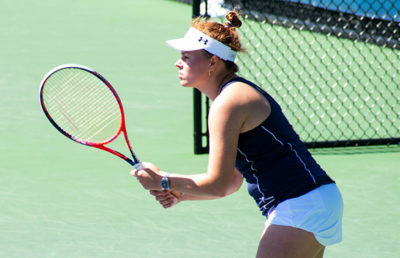 Hauger and Bright both completed perfect singles weekends, each winning two matches in four sets over Friday and Saturday. Rosenqvist was upset on court one by No. 57 Michaela Bayerlova in two sets, losing the second in a tiebreak. Smith clinched the match at 4-2, which was fitting since Saturday happened to be Cal’s Senior Day. Cal’s 4-3 Pac-12 record now has it at fifth in the conference standings, behind Washington, Stanford, USC and UCLA. 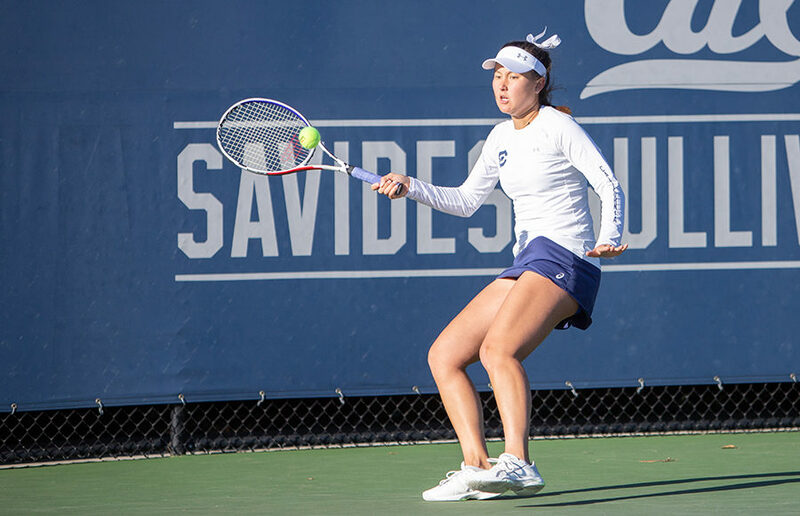 In the three recent matches against the Trojans, the Bruins and the Huskies, a win or two could have had Cal in the top three of the conference. Cal’s next true challenge will be at home against No. 5 Stanford on April 20, representing another chance to sneak into the top of the conference. Before that, Cal will travel to No. 39 Utah and unranked Colorado for an opportunity to pick up two more Pac-12 victories.